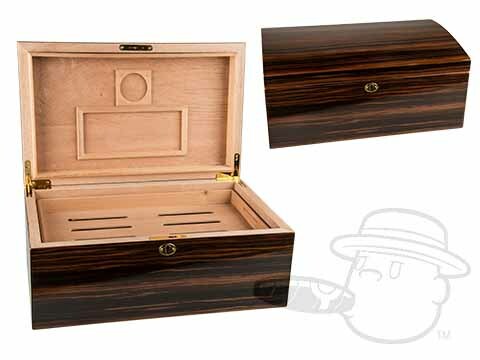 With its eye-catching ebony zebra wood grain finish and solid hand-crafted construction, the Bourbon St. Humidor is a stylish and sturdy way to keep up to 125 cigars in safe, smoke-ready condition. Fully lined in Premium Kiln Dried Spanish Cedar, the Bourbon St. Comes complete with humidifier and hygrometer, as well as a grate to optimize airflow so all of your stogies will receive the same steady stream of loving humidification. Dimensions: 14" x 9¼" x 6½"
14" x 9¼" x 6½"